A few weeks ago, I ended up following a fabulous blogger on twitter called Nicoletta Rocchiccioli. One of her posts was of a beautiful slab of homemade soap that looked out of this world. I soon discovered that she ran a small online business called Marshmallow Blends, a really cute outlet for her homemade products. Well needless to say, once I was on the site, I went mental. I ordered products for myself, boyfriend and mother and spent the next week eagerly awaiting the postman to bring me my box of goodies. 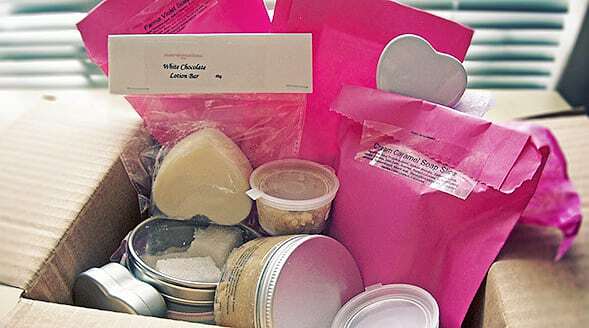 It finally arrived and I opened a big cardboard box filled with pink paper bags, metal tins, pots and jars filled with the most amazing smelling treats. My two favourites have to be the Caramel Soap and the Caramel Cupcake Body Scrub, oh and the Strawberry and Champagne lip butter. The soap smells amazingly sweet and just like a chunk of caramel fudge. It lathers like no other soap I’ve ever had and leaves your skin feeling incredibly hydrated and not dry in the slightest! It’s fantastically long lasting. I’ve been using it for the last few weeks and it doesn’t even look to have been used once! The Scrub smells like you can eat it, end of. You would not believe how much it actually smells like Caramel Cupcake, like a fresh batch has just been pulled out the oven. It’s a really powerful and coarse which is everything I look for in a body scrub, not something that slimes and slops about on your skin leaving it not one bit exfoliated, but leaving you absolutely gleaming. One other thing I did love about it was the fact that it foamed slightly and really adhered itself to the skin, giving you much longer to work it in. Yum. It also leaves your skin smelling of caramel long after using it. I could honestly write pages and pages about every single one of the products I ordered but I think you should try them out for yourself. I was so pleased, I wanted to support the business by giving Marshmallow Blends some space on my sidebar to advertise. Give it a click and let me know what you think. This article first appeared on MANFACE written by Thom Watson. It was published on Tuesday 15th May 2012 and was last updated on Monday 3rd April 2017 at 4:20pm. It's categorised under Body, Marshmallow Blends where you'll find more related content.